We are delighted to offer for sale this deceptively spacious and extended four bedroom detached bungalow, offering a quiet yet convenient location on one of High Lanes most desirable residential locations, giving easy access to High Lane center and all of it's excellent local amenities as well as being within close proximity of Lyme Park. The bungalow is of generous proportions having previously been thoughtfully extended, providing three reception rooms, a dining kitchen and four good sized bedrooms, most having built in bedroom furniture. In brief, accommodation comprises an entrance porch, leading to a welcoming entrance hallway with storage cupboard and stairs ascending to the first floor, there is a large lounge, dining room, conservatory and a fully fitted dining kitchen. To the ground floor, there is also three large bedrooms which are all serviced by the downstairs bathroom. The first floor reveals a further bedroom, with fitted bedroom furniture and having use of a en-suite bathroom. Externally, there is a long drive which provides ample off road parking and leads to the garage and passes the front garden, to the rear there is a flagged patio and then good sized lawned area with well stocked flower beds and borders. Advantages include gas central heating, double glazing and a garage. With stairs ascending to first floor, useful under stairs storage cupboard, two ceiling light points, radiator, power points, display shelving and alarm control panel. With uPVC double glazed and leaded bay window to the front elevation, wall light points, radiator, power points and an attractive living flame gas fire with Marble back and ornate hearth. With radiator, power points, coving to the ceiling and wall light points. With uPVC double glazed windows to front and either side, two wall light points and radiator. The kitchen has been fitted with a range of wooden wall and base level units, complimented further by roll top working surfaces that incorporate the stainless steel sink and drainer unit with tiled splash backs. Integrated appliances include a Zanussi hob with built in canopy extractor hood above, Zanussi oven and grill. There is then space/plumbing for a dishwasher. Coving to the ceiling, ceiling light point, tile effect flooring, uPVC double glazed window and door to rear, radiator and space for dining table. With uPVC double glazed and leaded window to the rear, coving to the ceiling, ceiling light point, power points and radiator. With two uPVC double glazed and leaded windows to the side elevation, coving to the ceiling, power points, radiator, ceiling light points and a range of modern fitted bedroom furniture comprising two double and one single wardrobe with hanging space and shelving, a chest of drawers, two bedside tables and a knee hole dresser unit with storage drawers to the side. With uPVC double glazed and leaded window to the rear elevation, ceiling light point with ceiling rose, coving to the ceiling, power points, radiator and again a range of modern fitted bedroom furniture comprising of two double and one single wardrobes with central drawers to the middle and a further wardrobe above and a co-ordinating chest of drawers. The bathroom has been fitted with a walk in shower cubicle with shower and tiled splash backs, pedestal wash hand basin and a WC. Tiled walls, two uPVC double glazed and leaded windows to the side, shaver socket, ceiling spotlights, extractor fan, radiator and wall mounted towel radiator. With storage cupboard giving access to eaves storage. With two Veluxe windows to the front and rear, giving beautiful views over Lyme Park and the cage, build in wardrobe with hanging space and shelving, access to eaves storage, radiator, power points and ceiling light point. With wash hand basin, WC and bath with shower attachment. Tiled walls, tiled floor, ceiling spot lights, chrome towel radiator and Veluxe window to the rear. The property is approached over a block paved drive, which provides off road parking and leads to the garage. 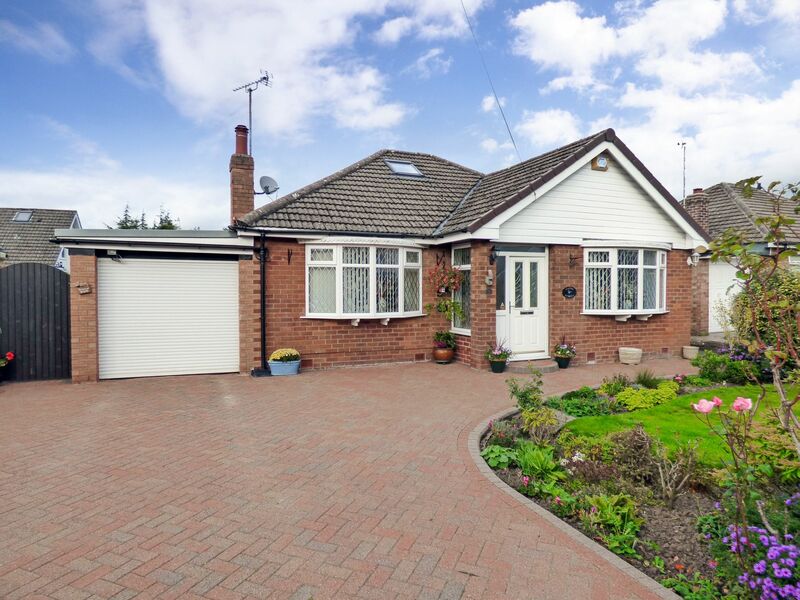 The drive passes the neat, shaped front garden which has deep flower beds and borders and an established hedge to the front which adds a degree of privacy to the front. There are paths that lead to either side of the property, which are securely gated. The rear of the property is mainly laid to lawn, again having mature and well stocked flower beds and borders, mature trees and hedges. To the immediate rear of the property there is a pleasant patio area. Outside cold water tap and security lighting. With up and over garage door to the front, two ceiling strip lights, plumbing for a washing machine and wall mounted Worcester combination boiler. UPVC door to the side elevation.